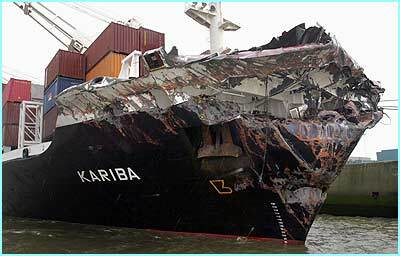 "The Largest Loss In The Auto Exporting Industry"
The collision between the 580-foot Bahamian-flagged container ship KARIBA and the 627-foot Norwegian-registered car carrier TRICOLOR happened at around 2.15 am of 14th December 2002. The evening before, TRICOLOR, 1987-built car-carrier, valued at US39 million, laden with a cargo of 2,871 luxury cars, the automotive cargo held a total value of $US100 million, had left Zeebrugge bound for Southampton, which was the last port in Europe before the Atlantic crossing to the US. The crew had routinely made the vessel ready for sea and gone to rest for the night in their cabins, except for those on watch. The two things that seafarers probably dread the most are collisions and fire. Knowing, however, that they had duly and properly prepared the vessel for sea for the voyage to Southampton and also trusting their shipmates on watch to navigate the vessel safely through the night in the very busy English Channel, they could go to sleep and rest before arrival in the morning and another busy port stay. Despite the crews efforts to prepare the vessel for sea and the officers attention to safe navigation in busy waters, the crews worst nightmare would become a reality that night and TRICOLOR was never to make it to the next port. At about 0215 hrs everybody on board TRICOLOR was shaken by a sudden impact and a terrifying noise. Immediately following the impact the general alarm was sounded and everyone except those on the bridge hurried from their cabins to the mustering station. The third engineer in the engine room miraculously managed to evacuate through the elevator shaft and accompanied the others on deck as TRICOLOR took on a rapidly increasing port list. They managed to launch an inflatable life raft and all managed to escape the sinking vessel safely. On the bridge the Captain, the second mate and the lookout had observed the vessel that they were about to overtake on a parallel course on their port side. Suddenly they became aware of the same vessel turning hard to starboard and witnessed the vessel abeam on their port side steaming right at TRICOLOR. The Captain immediately put the rudder hard to starboard but there was no way to avoid the other vessel and KARIBA hit TRICOLOR with its bow on TRICOLORs port side just aft of the bridge. The men on the bridge of TRICOLOR immediately sounded the general alarm to alert their resting companions and they also managed to send out distress signals on the radio before the heavy list to port forced them off the bridge and into the cold sea and the dark night. Luckily they were picked up by the KARIBAs crew, who managed to launch a life boat very quickly and initiate a search for the TRICOLORs crew. The crew in the life raft was picked up by the tugboat BOXER that happened to be in the vicinity. All 24 people on board TRICOLOR were rescued without any injuries other than the obviously horrific experience of suddenly finding oneself in utter danger by being forced to escape into the cold sea on a dark December night. The TRICOLOR sank 30 m deep in a matter of minutes, in the Pas-de-Calais, 20 miles northwest of Dunkirk. 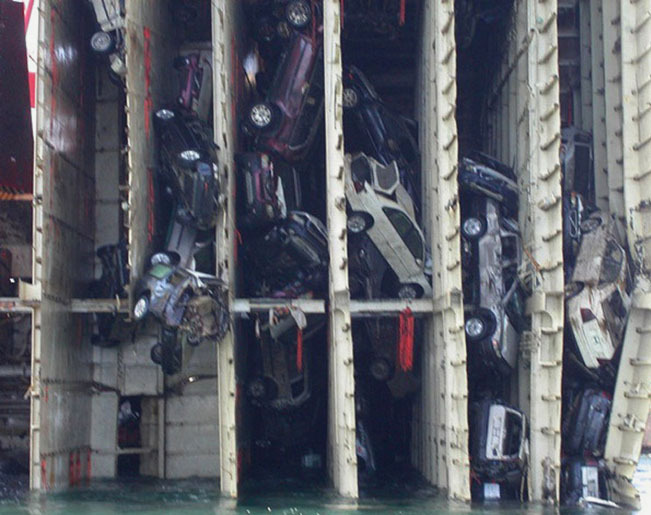 She was transporting 2,871 new luxury cars and 77 containers with tractors and crane parts. The wreck lay on the seabed, leaning on one side. The crew, composed of a Norwegian commanding officer, and one Swedish and 22 Philippine sailors, was rescued. The container ship the Kariba was able to continue her journey to Antwerp after colliding with the TRICOLOR. The vessel was transporting 1,990 tonnes of heavy fuel oil (IFO 380), a product of medium viscosity (380 cSt at 50C), divided between 8 ballasts, 200 m3 of diesel oil and 25 tonnes of lubricating oil. The wreck represented a risk for navigation and a potential source of pollution. The Prefecture Maritime of the Channel/North sea area immediately took emergency measures and called upon Cedres expertise. Cedres response centre sent an expert to Cherbourg. The analysis of the situation mainly concerned the assessment of a possible pollution risk (products involved, volumes and location in the ship, behaviour in the case of a spill, etc. ), the marking and the safety of sea traffic round the wreck and about the oil response at sea. Cedre was given fuel samples to analyze it and assess its dispersibility. Marking and surveillance operations of the navigation area around the wreck were set up. A patrol boat from the Gendarmerie Maritime ensured safe navigation in the area. A light buoy locating the wreck's position (10 m high and 2.65 m wide for a weight of 10 tonnes) was anchored 150 m from the wreck by the Phares et Balises department on Saturday 14 December. At the request of Cherbourg's Prefecture Maritime, Smit Salvage rescue company, contacted by the ship insurer, sent two other barges to reinforce the intervention system and to make the wreckage area safer. Despite this prevention system and the broadcast of many radio messages, the Nicola, a Dutch coasting vessel, collided with the wreck, which emerged by only a few centimetres, on 16 December around midnight. She succeeded in refloating herself with the help of two Belgian tugs on the 17th at 8 am. After this incident, two French and English patrol boats were sent on site to signal the wrecks position and the marking system around the TRICOLOR was totally revised. Four cardinal positioned light buoys (one in the east, one in the west and two in the south), one of which had a Racon system (buoy transmitting a specific radar echo easily visible on all screens), were set up 600 m from the wreck on 20 December. Another light buoy was installed on Monday 26 December 150 m from the TRICOLOR. Daily flights over the wreck were implemented by French, Belgian and British means to survey the potential pollution incident. A fifth fixed light buoy (north cardinal) was put in place on 26 December 2002. Despite these efforts, on 1st January 2003 at 7:20 pm, the Vicky, a Turkish oil tanker transporting 66,000 tonnes of kerosene, travelling from Antwerp to New York, hit the TRICOLOR wreck. She succeeded in refloating herself at 11 pm. The following day, the starboard part of the TRICOLOR sank further. The Smit Salvage company, mobilized by the ship owner, sent the barge Deurloo on site equipped with intervention means (a 30 tonne crane, a 30 m3 bunker, 600 m of Ro-boom 1100 and three hydraulic pumps) to rapidly empty the TRICOLORS oil tanks in order to avoid any pollution risk. Pumping operations began on 21 December 2002 and finished on 17 February 2003. The pollution risk from the wreck then became a minor problem but the risk of pollution from a colliding ship persisted until the wreck had been removed. 1700 of the 2200 m of fuel transported by the TRICOLOR was recovered. An invitation to haul the wreck was issued by the ship owner on 17 January, to which three companies responded. The contract was given to the consortium Combinatie Berging TRICOLOR and was signed on 11 April. By the end of June, the operations carried out had assessed the hull and designed a submarine cartography of the area around the wreck. Bollards (lashing points) were fixed to make wrecks sections resurface with the help of cranes. The next stage involved establishing a cutting system. The cutting began on 22 July 2003, after a certain delay due to bad weather conditions. Two rigs activated the diamond-tipped wire cable which was to cut the TRICOLOR into nine pieces. Think of the wire cable as a massive cheese cutter made up of a 15-inch-thick, 330-foot-long steel cable covered with spiked cylinders, or "bushes," that act as a serrated edge. Strung beneath the ship between two platforms, the cable cuts upward through the hull. The wire cable sliced the TRICOLOR into nine pieces, one 30-hour cut at a time. "You couldn't get a better cut with a saw on wood," says SMIT spokesperson Lars Walder. Two ships chartered by the ship owner, contributed to the surveillance of this special site and reinforced maritime security around the wreck. The French Navy also took part in the surveillance operation, due partly to the fact that next to the site was one of the busiest maritime channels in the world,18 % of world sea traffic passes through the Channel , North Sea shipping lane. The patrol boat the Flamant was sent to survey the site and its surroundings. She was later replaced by the patrol boat the Altair. The weather conditions were good and no technical problem were encountered, which meant that the cutting of the first part of the TRICOLOR was completed in 5 days. This part was then righted and loaded onto the barge the Giant IV which headed for the port of Zeebrugge (Belgium). To avoid any potential pollution during the cutting operation, the ship owner deployed the antipollution ship the Union Beaver in the area. 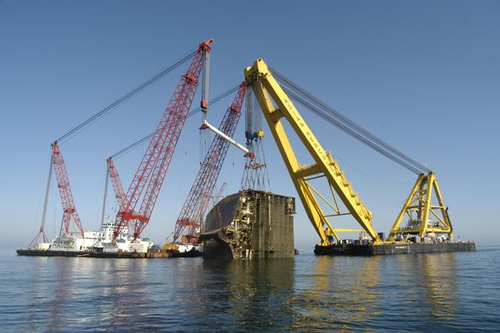 The removal of the remains of the double hull of the vessel was completed on the 19 July 2004. The starboard ramp was then recovered and the debris removed. The extraction of the remaining parts was carried out using large grab hooks and lasted several months. The fine clean-up operation then began, bringing the cars and the heavy equipment from the seabed to the surface. borne by the ship owner, therefore by delegation his service provider, SMIT Salvages authority, for everything that concerned work and the risk associated with it. borne by the different states (first France, then the United Kingdom in the framework of the Channel cooperation plan and Belgium eventually) for all other risks, particularly in the case of the wrecks boarding by another ship. On 15 January 2003, an oil slick was detected on Ambleteuse and Hardelot beaches (Pas-de-Calais). The following day, Wissant littoral (Pas-de-Calais) was affected. This pollution can be explained by the fact that during pumping operations, the plug of one of the bunkers, containing 170 m3 each, had been pulled out by one of the tugs chartered by the ship owner. Several cubic metres of propulsion fuel from the TRICOLOR spread over the sea. Another incident took place around 23 January, during a pumping operation. Following a mistake in the operation due to bad weather conditions on the scene of action, the companys barge in charge of the pumping damaged two valves of a bunker, freeing several tens of cubic metres of heavy fuel. Antipollution vessels were immediately put at France and Belgiums disposal by the ship owner. They added further to the means settled jointly with the two countries, under the Channel and North Sea Prefecture Maritime's control on the French side. The leaks were sealed and part of the pollution was recovered at sea. Thereafter aerial surveillance did not bring to light any further traces of pollution along the French coasts, except for residual iridescences around the wreck. However a few fragmented slicks drifting in the northeast were located near Belgium. On 2nd February, Polmars plane belonging to the French Customs located oil cakes near the coast, to the south of Boulogne and offshore. This pollution began to hit the coast between Bray-Dunes and the Belgian border from 4 February. The amount of pollution was difficult to estimate because of the oils behaviour, as it often floated beneath the surface. Even if on land and at sea Polmar Plans had not been triggered, volunteers from coastal towns became active and joined forces with prefectures and sub-prefectures. On land cleaning operations took place in January around Boulogne, and at the end of January and in February around Calais and Dunkirk, taking into account Cedres recommendations in terms of cleaning and net protection. A few hundred tonnes of oiled waste were collected and were treated in the incineration plant for special waste. Almost 5,500 oiled birds were found and treated by the LPA (league for the protection of animals) of Calais and the RSPCA of Dunkirk. The birds were then rehabilitated in an outdoor centre situated on Ghyvelde lake (close to Dunkirk). 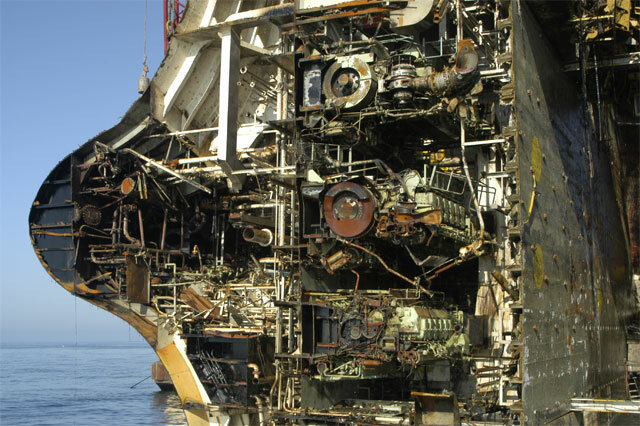 The total estimated operation cost of the salvage was around US40 million.